Two Feathers Cabin Lodging West Yellowstone vacation rental. Why cram into a motel room when you can spread out in style? 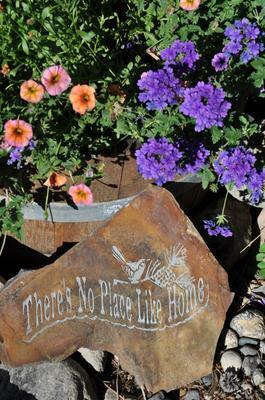 What's outside the box: Our guests tell us that they feel like they are out in the country even though this home is located within the town of West Yellowstone, on the northern most parkway. There is a private garden area with a picnic table and colorful umbrella for morning coffee or afternoon lunches, surrounded by green grass, beautiful plantings of hybrid lupine, columbine, echinacea, yarrow, even a strawberry patch and a tipi poles for the hops to grow up on. Mature Quaking Aspen, lodgepole pine, chokecherry, Mountain Ash and spruce trees create a wonderful oasis on this 1/3 acre property. View all sorts of Montana bird species that stop in for a drink and a bath at the two birdbaths including Pine Grosbeak, Evening Grosbeak, American Chipping Sparrow, White Crowned Sparrow, Cassin's Finch, Pine Siskins, Chickadees, Robins, Audubon's Warbler, Crossbills, Ruby Crowned Kinglets & hummingbirds. Summertime brings adorable chipmunks and squirrels to the grounds, it's quite entertaining watching them explore and chase each other about.